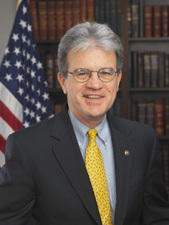 Tom Coburn, M.D., born March 14, 1948 (age 71), is a former Republican United States Senator from Oklahoma. As a Senator, Coburn supported raising taxes and he voted with Democrats to confirm liberal Elena Kagan as Solicitor General despite her complete lack of courtroom experience, which enabled her to become a U.S. Supreme Court Justice and hold power for the Left for decades into the future. Coburn became a lobbyist at the state level after he left office, in order to promote rewriting the Constitution by holding a Con Con (Convention of States). Justice Scalia called this a "horrible idea," and most principled conservatives strongly oppose it. "In 1970, Dr. Coburn graduated with an accounting degree from Oklahoma State University. One of the Top Ten seniors in the School of Business, Dr. Coburn served as president of the College of Business Student Council. From 1970 to 1978, Dr. Coburn served as manufacturing manager at the Ophthalmic Division of Coburn Optical Industries in Colonial Heights, Virginia. Under his leadership, the Virginia division of Coburn Optical grew from 13 employees to more than 350 and captured 35 percent of the U.S. market. After the family business was sold, Dr. Coburn changed the course of his life by returning to school to become a physician. Again he emerged as a leader, becoming president of his class at the University of Oklahoma Medical School where he graduated in 1983. He then did his internship in general surgery at St. Anthony's Hospital in Oklahoma City and family practice residency at the University of Arkansas, Fort Smith. Dr. Coburn returned to Muskogee where he specializes in family medicine, obstetrics and the treatment of allergies. Dr. Coburn and his associates serve more than 15,000 patients for whom he has personally delivered more than 4,000 babies. Dr. Coburn also is a two-time cancer survivor. Coburn and his wife, Carolyn, a former Miss Oklahoma, were married in 1968 and have three children and four grandchildren. They are members of Muskogee's New Community Church." Dr. Coburn is a personal friend of Barack Obama, though both acknowledge their polar opposition in most political matters. Their friendship began while Obama was in the Senate and has continued into his presidency. When Coburn was first elected in to the House of Representatives in 1994, the year of the Republican Revolution he stated from the beginning that he would only serve three terms (if he was re-elected each time). Coburn believes in the idea of a term limited citizen legislator. In other words, a citizen who serves in Congress for several years and then goes home to live under the laws they have helped to create. "During his tenure in the House, Dr. Coburn wrote and passed far-reaching legislation. These include laws to expand seniors' health care options, to protect access to home health care in rural areas and to allow Americans to access cheaper medications from Canada and other nations. Dr. Coburn also wrote a law intended to prevent baby AIDS. The Wall Street Journal said about the law, "In 10 long years of AIDS politics and funding, this is actually the first legislation to pass in this country that will rescue babies." He also wrote a law to renew and reform federal AIDS care programs. "In 2002, President George Bush chose Dr. Coburn to serve as co-chair of the President's Advisory Council on HIV/AIDS (PACHA)." In 2004, however, Coburn decided to return to public life and ran for and won a seat as a United States Senator from Oklahoma. In keeping with the idea of the citizen legislator, Coburn has promised to serve only two terms in the Senate. In an article entitled, "Week of July 18, 2007," columnist Robert D. Novak discussed the continuing anti-earmark fight by several member of the Upper and Lower Houses of Congress, Tom Coburn among them. "Senators Tom Coburn (R-Okla.) and Jim DeMint (R-S.C.) will continue in the Senate the anti-earmark fight that Representatives Jeff Flake (R-Ariz.) and Jeb Hensarling (R-Tex.) have been fighting in the House. Two Senate amendments to the Defense bill will target an earmark by one of Flake's favorite targets, Rep. John Murtha (D-Pa.), and a Nebraska defense company. Two other amendments will require a competition to determine the best rifle for U.S. soldiers and require competitive contract processes for winning earmarked Defense money. Coburn leads the charge in stripping individual earmarks, while DeMint pushes for new transparency rules." On his website, Coburn also provides an explanation of why he is fighting against earmarks in addition to a scorecard of what he has done during the 109th and 110th Congresses. "I ran for the Senate, in part, to reduce wasteful Washington, D.C. spending, re-prioritize spending to ensure essential needs are not compromised by parochial political interests and to reform the way our government spends money. Our national debt now surpasses $8.7 trillion, important programs like Social Security and Medicare are in danger of bankruptcy, our nation is fighting a global War on Terror and we still are paying for costs associated with the most expensive natural disaster in our nation’s history. Every family in America must make decisions that require prioritizing and financial restraint to meet their financial situation and expect the government to do the same. But politicians in Washington have for too long avoided making tough decisions and have prioritized their next election over the next generation. Clearly this in not the time for business as usual in Washington and the borrow and spend mentality must come to an end if we are to ensure that the next generation of Americans inherit the same standard of living and that our seniors can enjoy financial security during their retirement years. Coburn has recently been criticized by the Marine Corps Times newspaper for stalling Senate approval of a major veterans' benefits bill. ↑ Marine Corps Times, 3 November 2009. This page has been accessed 13,261 times.